Agriculture is an ecosystem and needs to be treated as such. That was the conclusion reached by business partners and former college roommates Tyler Gaudet and Jackson McLeod, who grow greens and raise fish at Fluid Farms. 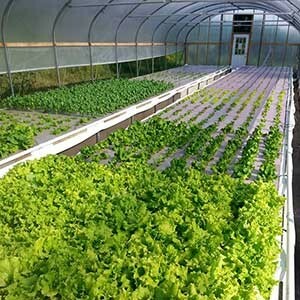 Fluid Farms grows in a 5,000-square foot aquaponics greenhouse in North Yarmouth, Maine. The farm sells a variety of greens to area restaurants, and will sell their first fish (tilapia) this year. The pair avoids the “sustainability” moniker, due to their belief that no form of production agriculture is 100 percent sustainable. Instead, they strive for a system that is not strictly dependent on inputs and outputs. The “living system” that Gaudet describes begins with feeding fish. Fish waste is converted by bacteria into calcium, nitrogen, phosphorous and magnesium. Water containing these nutrients is then applied to hydroponic beds. As the water filters through the soil, plants utilize the nutritive components, and the rest of the water goes back in the fish tank. At this point, the cycle starts over. McLeod and Gaudet value sustainability potential not only with how they grow greens and raise fish, but also in their business model. “Fail early and fast, so you’re not over-extended,” says McLeod. Indeed, the risk of failure has been a constant presence. Both Gaudet and McLeod express frustration at the lack of good business and operations models for an aquaponics farm. McLeod, who brings engineering expertise to the endeavor, notes the difficulty in merely purchasing aquaponics components. The pair found themselves relying on research articles and what credible information they could find on the Internet. Gaudet started his aquaponics journey by growing tomatoes and peppers at his apartment in Portland, Maine after he graduated from college in 2007. When McLeod came on board after moving back to New England from Colorado, the operation expanded to a warehouse in Portland, where they soon were not able to keep up with demand from restaurants for their produce. The friends then raised over $9,000 from a Kickstarter campaign, enough money to purchase their current commercial greenhouse frame. Two years into the endeavor, Fluid Farms is not yet profitable enough to be a full-time, sole source of income for Gaudet and McLeod. The greenhouse was erected last year. In the meantime, Gaudet works as a fisheries biologist, and McLeod as a mechanical engineer. Both use their respective areas of expertise in their aquaponics project. “We scrapped things together with as much thrift as possible,” says McLeod. Currently, the pair is trying to refine the farm’s business model, minimize risk, increase profitability and reduce capital expenses. They are looking at options such as selling to additional area restaurants, selling at a farmers’ market, participating in a CSA, utilizing a distributor and displaying their greens in a storefront. During the next five years, Gaudet and McLeod envision growing their business to the point that it can support them both. This includes figuring out how large Fluid Farms needs to be. The former students at St. Michael’s College in Colchester, Vermont (McLeod transferred and graduated from the University of Maine) say that while they did not learn much about aquaponics in college, they gained valuable skills that have proven invaluable in their agricultural pursuits: critical and creative thinking, the ability to observe and react, and the flexibility needed to deal with risk and uncertainty. “Being willing to assume a certain amount of uncertainty and not being scared of the unknown has been important,” Gaudet says.